Few shows, particularly those outside of the arena of the main television networks, have made quite the impact that Mad Men has made on modern television series. Its historical authenticity and steamy plotlines give the show a unique combination of high ratings and critical acclaim. On October 8th, Television Symposium delighted its students by featuring a high-profile panel of guests from Mad Men, with a Q&A moderated by Professor Howard Rosenberg. The main takeaway message? Working in television is not for the faint of heart. Each Monday evening, Television Symposium profiles a television show and features a guest or guests to discuss their work and field questions from students hoping to learn more about the television industry. 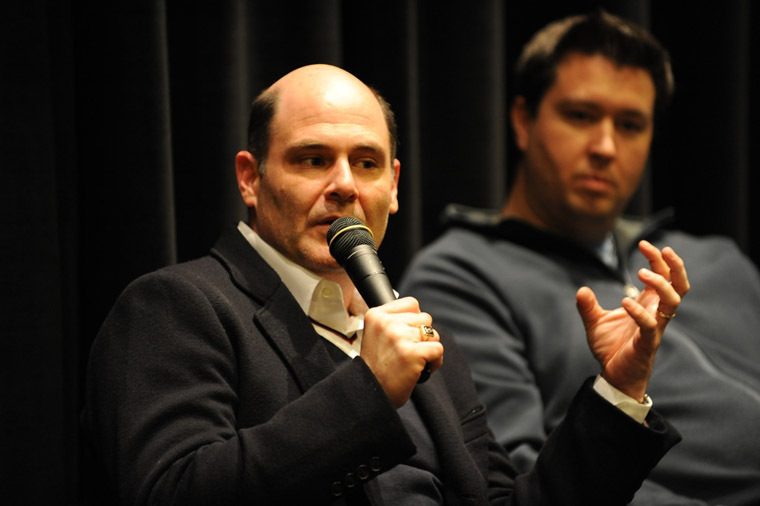 Following Monday’s screening of the fifth season’s finale, the panel included Mad Men creator and writer Matthew Weiner (SCA MFA Production alum ‘90), executive producer Scott Hornbacher, writer Jonathan Igla, director of photography Chris Manley, costume designer Janie Bryant, editor Christopher Gay and actor Rich Sommer, who plays the recurring role of Harry Crane. Mad Men is a period drama set in the 1960s, which explores the business of ad agencies in New York City as well as the personal lives and issues of its inhabitants. The seasons have developed within historical context of the decade, highlighting the tumultuous era of the 1960s. The series has claimed fifteen Emmys, four of which were for Outstanding Drama Series for its first four seasons, and four Golden Globe Awards. Mad Men has completed its fifth season and is underway for its sixth, which will air on a yet unannounced date in 2013.